Each of us likely knows one of those parents who longs for, or has, a champion athlete child — one who racks up the trophies and titles and medals and perhaps has a wall dedicated to his or her feats in the house. Spitfire’s family may need to build him a room. 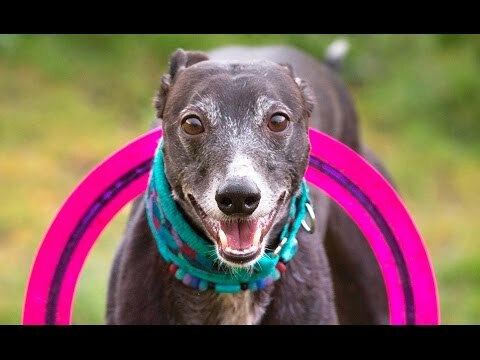 This whippet is a super-champion, who breaks world records like dishes at a Greek wedding. Case in point: this video below, a 31-foot long jump that, you guessed it, set the world record for longest-ever jump by a dog. One record is hardly enough for this world-class athlete, though. Spitfire is also the world record-holder in speed retrieval. And while we’re showing him off like he’s ours, check out this 8-foot vertical! In an interview with Outside Online earlier this year, Spitfire’s trainer, Kristi Baird explained what makes a legendary dog different from a regular dog. Mud puddles?! Well, that means that on top of being a world champion, Spitfire’s also just a regular dog – which, amazing feats and athletic prowess notwithstanding – is his best quality, if you ask us. Do you have a DockDog in the making? If your dog loves to run, jump and swim then DockDogs could be the answer to getting your dog the exercise and fun that he or she craves while you spend time doing things together. This organization welcomes any breed, any mix, any size to come out and join their Dock Diving family! In fact, dock diving is one of the fastest growing sports on four legs! Visit their website for all kinds of information on how to get started!